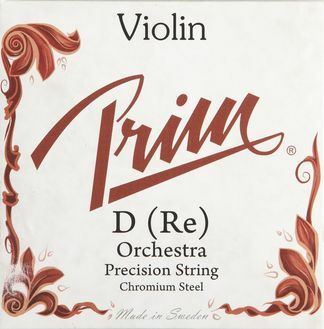 Prim Violin Strings are used by a wide range of musicians. Long-lasting, with quick response and a bright powerful sound they are for example used by students at all levels, in Blue Grass, folk music and many other fields. The Strings are available in three gauges; Soft, Medium and Orchestra. Orchestra is the heaviest gauge. The Medium gauge suits most instruments well, but be sure to experiment; in many instruments, the best sound is obtained by using a combination of different gauges! I just put on a complete set of Prim Medium guage strings on my French Colin-Mezin 1922 violin. After one week of playing, the strings are well settled and pitch stable. Prim strings have an edge to them and they have super volume production. They are steel core and the response is excellent. The strings carry well in a large hall but sound coarse in a chamber music setting. I therefore change to my other violin for playing in small rooms. The G string is very bold and dominates over the other three strings. The D string sound is substantial and is more powerful than the A string. The A string circumference seems small under the fingers so I may have to buy a Prim Heavy guage to compensate. The E string is very responsive but the quality is inferior to a variety of other E strings I have tried. In short, I heartily endorse the lower two Prim strings. I am sure that I can compensate for the thin A string with a heavy guage replacement. As far as the E string is concerned, my plan is to experiment with another brand to improve the singing quality I desire. The price of Prim strings is very reasonable and they are very long which makes for better winding on the pegs. They have a friction coating which hugs to the pegs and does not slip. The Prim strings are very easy to thread which allows me to make minor adjustments easily.